Of all the questions I was asked, this one and my answer to it created the most comment from those who read the interview. Most of the feedback was of the positive kind, though it did raise an eyebrow or two and garner a couple of negative responses. One went so far as to point at my answer was ‘Naive and symptomatic of the malaise that self-publishing has created within the industry.‘ A criticism which if I am perfectly honest, I am not entirely sure I even understand. My view on the stigma of self-publishing has not changed. Having read a few emails in response to my opinion as it was voiced in the interview, I decided it might be wise to expand on what my view is. Not least because the original reply was in an interview, written with a certain degree of humorous intent and not trying to explain my opinion as such. Also, it gives me a chance to respond to the criticisms some had of this small portion of the interview. Firstly, and just to be entirely clear, I stand by every word I said about James Paterson novels. Which, I feel I need to add here, was a comment on his publishers, not the book themselves. I was accused of deriding the writer because I am jealous of Paterson and his success. Let me, therefore, be clear about this, yes I am. I would love to make my living by writing books, I am just not sure I would want to do it by sticking my name on books others have written. Patterson, because of the big name he is, sells books on that name alone. The point I was making, however, was about the publishing industry. Not about Pattersons books themselves. Perhaps unsurprisingly, publishers are more inclined to publish books they know will sell with minimum effort from themselves. There is nothing wrong with this as those authors have earned that selling power by writing books people love. It is however also the reason James Paterson’s name gets flung onto books that were ‘co-written’ by ‘Joe Bloggs’. They stick a ‘with’ between the James Patterson in big print and the ‘Joe Bloggs’ in small print. Then they stick them on the shelves, using the big name to shift them. Patterson is not alone in this, he just tends to be the one who stands out because of his ‘masterclass’ video lectures which faceache seems determined I should pay for the privilege of watching. In my personal opinion, I would prefer the publishing industry to work a little harder with unknown writers, rather than tag them onto a big name. Those ‘co-writers’ who have written the bulk of these novels deserve to have them published and championed in their own name. At the same time, however, let’s be honest here, the big sellers make the industry the profits it needs to invest in first-time authors, it’s just the way it is. And those ‘co-writers’ probably get paid rather better for these work under the Paterson banner than they would for work published purely under their own names so who the hell am I to judge. The other chunk of correspondence was about self-publishing, and I also stand by my own reasons for choosing to do so over traditional James Paterson loving publishing houses. 1/ As much as I enjoy genre fiction, I do not want to write a book about Harold Potter boy wizard, or 50 shades of off-white, or a dusk-light trilogy. I don’t want to only write one particular brand of science fiction or a book someone will recognise as inspired by the commercial success of another. Those stories have been told, I don’t want to retell them, but big publishing houses prefer to stick with what they know will sell. This is, of course, counter-intuitive as the original genre creators were new, different and unexpected hits, which made publishers willing to take a punt on them small fortunes. 2/ Once I had finally written that first book, I wanted to go and write something else entirely. What I did not want was to be tied into a series deal where I have to rewrite my first book again, just more so. Rinse and repeat, publishers like a series. This is not to say I won’t write sequels (one of my current projects is a sequel to Passing place) But I don’t want to have to write anything. 3/ I only want to write what I want to write, this is not my day job, it does not pay my bills. Sure that’s the dream, but until then I will stick to doing what makes me happiest as a writer. Self-publish allows me to do that because I only answer to myself. In common with most indie authors I know who self-publish, I have never actually tried to get a publishing deal. I have submitted the odd short story to magazines but never submitted a novel to a publishing house. Why? You ask… well simply put because I didn’t have to. Nor for that matter did I want to, for the reasons above. I am sure that had I submitted Cider lane it would have sat in a slush pile. Unless I was fortunate, to say the least. Even rejection letters are hard to come by. Finding a publisher willing to take a punt on a virgin novelist is rare and requires no small amount of luck. Cider Lane doesn’t really fit neatly into a little box of a genre. ‘Passing Place’ certainly doesn’t drop neatly into a particular genre, though sci-fi and fantasy are a fairly broad church, so it is an easier fit than my first novel. 4/ I have lost count of the times I have read faceache posts by angry writers. Many of whom seem one rejection letter away from the edge… They complain about publishers not been willing to take a chance on them. They complain about agents. They complain that they have been told their book is too long, too short, the wrong fit, the wrong book. 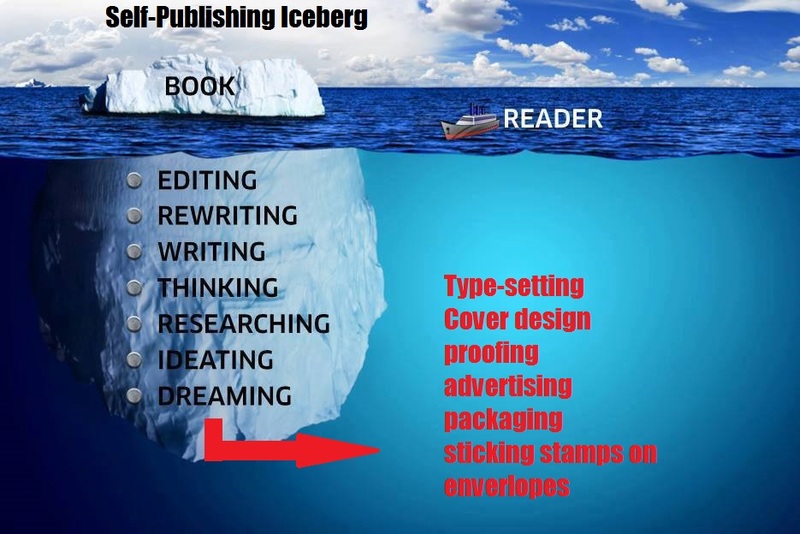 Which is another reason that I like self-publishing. I like the freedom self-publishing grants, and while it’s rewards are hard won, they are hard-won by yourself. And no one tells you that the novel you so love is too long, short, or does not fit. It’s my vision, it’s my story, I will not be told to change it because it doesn’t fit your narrow definition of what a novel has to be. I do however hate the label, ‘self-published’ I vastly prefer the word ‘indie’. Perhaps this has a lot to do with my love of the alternative music scene… And I know there is some dross out there, but the majority of ‘indie’ writers work hard to put out the best work they can, and are more interest in the work than the money. There is a lot more I could have put on my iceberg, but you get the point I am sure. My two novels represent about six years of work between them, to have them written off as unworthy because of a stigma attached to the self-published is both insulting to me and others who chose to self-publish, and says more about the ones doing the writing off than the writers. This entry was posted in opinion, publication, self-publishing, writes, writing and tagged #amwriting, self-publishing, writerslife, writingtips. Bookmark the permalink.